ALL THE MISCREANTS… both players and pawns of Jew-ruled America, are acting out their parts center-stage in the crisis in Ukraine. 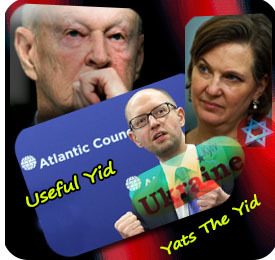 Whether its Kerry of the Jew-infested State Department; Nuland of the Jew-led neocon cabal that sets foreign policy in Jew-ruined America; or Yats the Yid, Jewmerica’s shill in Kiev; their aim is the same: the extirpation of Ukraine’s sovereignty. Ukraine is splintering into opposing factions and Jewmerica couldn’t be more pleased. Balkanization of a nation plays into Jewry’s hands as it creates fissures and weak pockets vulnerable to Jewish control. Is not weakened-Kiev’s willing subjection to the Jew-owned IMF proof enough of Jewry’s profiteering from its attempted divide and conquer operation via the Maidan? The key that unlocks Jewmerica’s agenda in Ukraine is provided by the Jew-ridden State Department’s “Silk Road” Policy Statement. Entitled, “U.S. Support for the New Silk Road,” the Statement asserts Jewmerica’s design for full spectrum dominance throughout “South and Central Asia,” that is, the Eurasian geopolitical bloc. “Ever since the continents started interacting politically, Eurasia has been the center of world power. It is imperative that no challenger dominates Eurasia and thus of challenging America (Russia),” says Brzezinski. 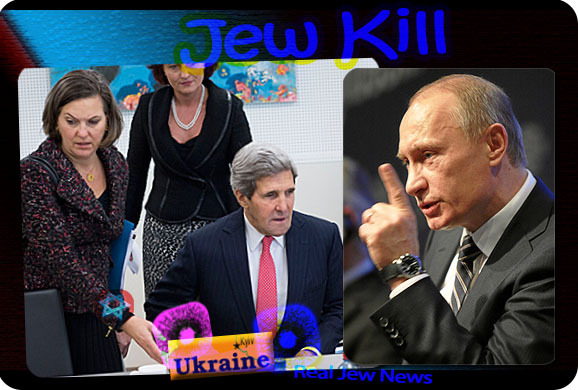 The people of Ukraine are simply useful tools in the hands of Jew-ruled America. Regime change, IMF restructuring, provoking civil war, and demonizing Putin, is all a means to prevent a united Ukraine from entering Russia’s sphere of “Eurasian” economic influence in former Soviet space. Putin’s Eurasian Union, which he calls, “A Future Born Today,” promises to bring prosperity to all of Russia’s allies. This is why Germany’s business community opposes Jewmerica’s “sanctions” against Russia. Germany has much to gain via Putin’s Eurasian Union which (in saner anti-Jewish times) would establish Ukraine as a trade bridge between Europe, Russia, and China. AS AN ORTHODOX CHRISTIAN, Putin subscribes to the Byzantine model of a commonwealth of inter-connected peoples. Putin outlined his vision for Ukraine in his 2013 speech, Orthodox-Slavic Values, while visiting Kiev. Absent of any intention of “annexing” Ukraine, Putin affirmed that a sovereign and unified Ukraine tied to Russia both economically and culturally would realize the Orthodox vision of peoples working together in harmony. Putin’s national-patriotism is of a different kind than “racialist-centered” nationalism. His patriotism accommodates 153 different ethnicities of four major religions who are all Russian citizens; who are historically part of Russian culture and society, particularly the Muslims; and have contributed to the supra-national or imperial identity of the Russian Federation. Putin wasn’t yearning for a return to the atheist Soviet system or hopes of a future empire, but lamenting the fragmentation of the unity of the former Russian geopolitical bloc made up of many races, religions, and ethnicities. “Federalization” of Ukraine, according to Putin, would grant its various “ethnic-differentiated’ regions protection against Western-influenced Kiev while ensuring a unified Ukraine. Putin’s support of Syria, Iran, and his esteem for Marie Le Pen’s French National Front, Hungary’s Jobbik, and Nick Griffin’s BNP—in their quest for independence from Jewmerica—underscores his vision that national interests should displace a global policeman’s (America’s) interests. Jew-ruled Kerry would like nothing more than to bait Russia into getting bogged down in a “guerrilla warfare” quagmire with the Right Sector in Eastern Ukraine. Putin won’t fall far it. He’s got bigger fish to fry. A “Silk Road” of his own joining Germany and China through Russia is in the making. Checkmate! …Jewmerica’s ‘grand chessboard’ is falling through the cracks. It’s ALL OVER for Jewmerica. It’s just a matter of time before Jew-ruined Jewmerica hits the trash can of history. We MUST while thinking globally ACT locally. Join a Church community and stay connected with committed Christians throughout the country. THIS is our ONLY HOPE for survival while Jewmerica falls into the sewer of history. The Byzantine Roman Empire carefully excluded Jews from crucial jobs, including government, banking, and education. A stark reminder for America what happens if you let Jews loose in the vital positions of a state. The Byzantine Roman Empire lasted over a thousand years, thanks to this policy, while Jew-infested America is doomed. The JEW World Order Controlled American Government is the ENEMY. The JEW World Order has HIJACKED the American Government. Illegal Coup d’état of USA. America is run by the EXTREME JEWS who are COMMUNIST “ROBBER BARONS” doing Land Grabs, theft, fraud and corruption the very same as they did in the JEW Bolshevik Revolution USSR. There is only ONE group of TERRORISTS in the World today and they are the Synagogue of Satin WAR MONGERING JEWS. Every time the JEW World Order says it’s a “Conspiracy Theory,” then we all know for certain that it is TRUE and they are hiding their crimes. The term “Conspiracy Theory” is a JEW LIE to conceal the TRUTH. The “United Sates Military” (a wholly unlawful organization) is the reason we now have almost every country on the planet hating our guts and wanting to blow us up. The JEW World Order has been carrying out “FALSE FLAGS” in almost every Country World Wide and blaming the Muslims and Arabs for 100 years. Do you blame the Muslims and Arabs for hating America? Americans need to purge the JEW World Order Criminal Mafia out of the American Government. The JEW World Order COMMUNIST Criminal Mafia, full stop. Ukraine is a clear example of Jewish American Policy. Destabilization of elected government and regime change to a puppet Jew (central banker from Ukraine). Then quickly change laws and start the plunder of gold reserve, accepting IMF conditions what ever they will be, prohibit the Russian language, escalating conflict, send the army east to create civil war. IMF will secure bankers’ loans by selling state assets (energy company), cut wages and pensions by 50%, like in Greece and Balticum. EU will take control through central bank, international banks and maybe NATO. Chevron, Exxon and Shell have billion of dollars investment in western Ukraine and hope to produce lots of gas and sell it to Europe in competition with Russian gas. It is important for Putin to reduce the Jews damage in Ukraine so they can not control and interfere with Russian gas transit through Ukraine. Jew America broke Ukraine and they have no intention to fix it, and people without food and heat will sooner or later rebel. This is not over and Putin knows their plan to encircle Russia. A trade zone in Eurasia with Europe, Russia and China with trade in Euros, Rubles and Yuans will end Jew Americas US-dollar dominance in world trade. Jew America will try to prevent Eurasia trade zone by dividing Europe, NATO countries against Russia. This crisis will be used to demonize Putin (new Evil Hitler) and Russia to create more arm sales, and maybe Sweden and Finland will now join NATO. Nudelman looks like she could do with a good wash in holy water. But that would sear her flesh, so I expect she will choose to continue looking unkempt and filthy. I cannot imagine that the people of Ukraine will ever vote for a government that is promising draconian cuts to social welfare programmes, a halving of state pensions, and a doubling of gas prices, whilst committing Ukraine to a future in which they will no longer be able to export their manufactured goods to the EU as their technological standards are inadequate, but only to import. They will clearly become a serf kingdom of the EU, shackled by debt forever, and with their infrastructure entirely mortgaged to the IMF and its jewish controllers. Hence the efforts by the fascist junta to throw the nation into the confusion and mayhem of civil war before the May 25 election, as spurred on by the recent satan-inspired visits of Biden, Brennan and McCain. Political sentiment seems to be favouring the Chocolate King Poroshenko at the moment, with the convicted criminal and fraudster Julia Timoshenko a poor second favourite for President. The city of Constantinopol was the last stronghold of the Byzantine Roman Empire. Not all people are like that. But their Zionist government is sickeningly evil. To ensure their own luxury and constant flow of resources, they are sucking the wealth of weak third world nations like leeches. Many people are tired and disgusted of the current US government’s “big daddy” attitude. I hope Christ sheds his light on the minds of fair, honest and good American population. So they can see how much damage these foreign agents who now rule America, are doing to the world in hopes of sealing total control over the globe. I absolutely loathe the fact that these Zionist politicians like to teach us how the world and it’s people should work (the NWO) and what people want for themselves, but I fully doubt that these uber rich, selfish jerks even know a thing about reality. How much an average man has to struggle in this world to feed his family, to survive in a world where everything is becoming expensive and out of reach of a common man day by day. At times, even basic necessities like food, water, electricity and medicines are not available to poor people. All because of Zionist control over wealth and high corruption of politicians. Just saw a frightening show about the use of high tech walking and running robot soldiers that will be deployed to do their dirty work. It will be very difficult (but not impossible) to dismantle this army. No ambiguities now. For good or ill Putin is a genius, and which, let’s pray. In fact he may be so smart he might do it peacefully and marginalize the psychopaths to prison where they belong and change even God’s prescription. There are caveats, but I’m not going to say them until the spots fit the cat or am nearly certain. I always thought the argument for monarchy in Plato’s republic was extremely valid. Now I see it evokes decadence and psychopathology in mere mortals, in spite of delightful little George. I was wrong. So very wrong, and Charles has realized too late. Let’s see if a coin outside of Russia with Putin’s head on it is in the future. It’s a barometer of sorts. I’m not sure, but I don’t see statues, or massive portrait campaigns. Dear God, I hope he is what it appears he is. I’ll defect in a nanosecond. The Obama regime, wallowing in hubris and arrogance, has recklessly escalated the Ukrainian crisis into a crisis with Russia. Whether intentionally or stupidly, Washington’s propagandistic lies are driving the crisis to war. Unwilling to listen to any more of Washington’s senseless threats, Moscow no longer accepts telephone calls from Obama and US top officials. The crisis in Ukraine originated with Washington’s overthrow of the elected democratic government and its replacement with Washington’s hand-chosen stooges. The stooges proceeded to act in word and deed against the populations in the former Russian territories that Soviet Communist Party leaders had attached to Ukraine. The consequence of this foolish policy is agitation on the part of the Russian-speaking populations to return to Russia. Crimea has already rejoined Russia, and eastern Ukraine and other parts of southern Ukraine are likely to follow. Instead of realizing its mistake, the Obama regime has encouraged the stooges Washington installed in Kiev to use violence against those in the Russian-speaking areas who are agitating for referendums so that they can vote their return to Russia. The Obama regime has encouraged violence despite President Putin’s clear statement that the Russian military will not occupy Ukraine unless violence is used against the protesters. We can safely conclude that Washington either does not listen when spoken to, or Washington desires violence. Unfortunately for Putin, Germany is a puppet state of the US. Worse yet, Germany exports millions of goods, including millions of dollars worth of cars made by VW, BMW, Audi, and Mercedes, and so much more to the US and its gang that at the present time Germany has no other market to go to if the US bans German products. So as long as the US remains the world’s numbering market, Germany and even China are not in a strong position to support Putin. Of course how the citizens of the US would react if they could not buy cheap Chinese goods could be a key to Putin’s solving this mess. You are a strong proponent of Putin as an anti-Jew force in the World, however I’m not sure about this. Putin did rise through the ranks of a Jew-controlled system and was personally endorsed by the Jewish shill Yeltsin. Putin never eradicated the Jewish control in Russia, he merely weakened it. Today Jewish billionaire oligarchs are still roaming free in Russia and control many aspects of Russian economy. Putin has friendly relations with Israhell and has given in to Zionist lobbying before in regards to selling arms to and not opposing sanctions on Iran. I have too many concerns about Putin that doesn’t give me the same perception of him that you have. Keep on the good work, Putin…God’s strength! When the Ukraine had it’s former crisis named the “Holodomor” in 1933, the USA had a dustbowl “rain” drought crisis from 1930 to 1936. It is interesting therefore that the present crisis in the Ukraine now also corresponds with another great rain drought crisis within the USA in the state of California. Now it’s only waiting for the payday, in which the Jewmongers and opportunists are finally getting their wage. As I am also extremely anti European Union. I hope the whole mess will end as soon, with the help of OUR President Vladimir Putin. We pray for him, Russia and Brother Nathanael (not by force or violence, but through MY soul). I hope Moscow has enough sense to commission someone in the Putin Administration to read +BN’s articles and share with others. Because if they do, they will readily learn that there are Americans very unhappy (more poignantly, very pissed off!) with the present cabal in Washington leading this nation and much of the rest of the world so astray. It is amazing Putin said the collapse of the Soviet Union was a major geopolitical disaster. At the time my understanding was the West considered its occurrence as being one to be hailed with gladness. 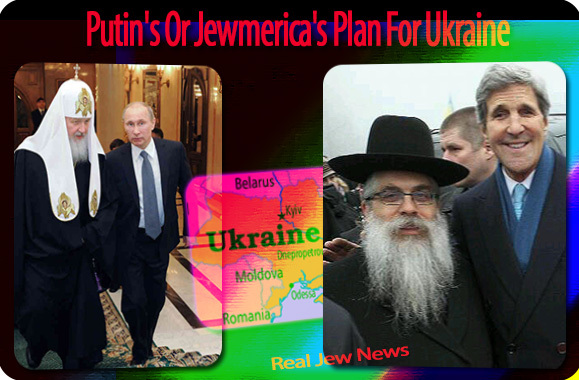 Putin has the Zionist Jews of Amerika right where he needs them. His Eurasian Union plan is a win-win for Russia, Germany, the other Slavic nations, and others seeking to free themselves from Jewry’s grasp. Meanwhile Amerika is in decline, morally, socially, economically, and politically (republics die out after two centuries roughly) and our meddling with Ukraine has meant that our imbecile government has shot itself in the foot. I can’t say more good things about the Servant of God and my brother in Christ Putin, he is ruling just as the holy Orthodox emperors before him well done, Mr. Putin! I tend to agree with you and think Bro Nat is too optimistic about who Putin is and what he can do. Putin is one man with significant power now but he can die at any time and will be gone in 8 years anyway, and there will be about 33 Jewish Oligarchs still in place after he is gone. Whoever has the most money usually wins and they have all the endurance money can buy. Here are some more interesting associations between the Ukraine crisis and the present California “rain” drought crisis. The territory of the Ukraine is located in the same southwest corner direction from the territory of Russia, California is also in this same “southwest” direction corner in the continental USA’s 48 states. Also both the first letters of these two names are similar in English, as a U and a C are basically the same except rotated by 90 or 270 angular degrees. The Ukraine is also associated with that which blocks Russia’s desire to have naval access to the waters of the Black Sea, and also the Ukraine is associated with the desire of some persons and groups who would desire that this Russian Black Sea naval access be blocked or prevented from happening. As the time distance between California and the Ukraine is about 12 hours difference, then in a real sense these two are almost the exact opposite and inversion of the other in physical location. Also the names of the larger waters that are located close to these two areas are exactly opposite in meaning. The word “Black” as in Black Sea sometimes refers to danger, and the Pacific Ocean refers to a peaceful ocean. He is obviously a long-term thinker and planner and has proven to be an excellent analyst and strategist. He is a leader who can quietly work toward his goals under mounds of accusations and myths that have been steadily leveled at him since he became Russia’s second president. I’ve stood by silently watching the demonization of Putin grow since it began in the early 2000s –– I pondered on computer my thoughts and concerns, hoping eventually to include them in a book (which was published in 2011). I don’t pretend to be an expert, just a program developer in the USSR and Russia for the past 30 years. But during this time, I’ve have had far more direct, on-ground contact with Russians of all stripes across 11 time zones than any of the Western reporters or for that matter any of Washington’s officials. As with personalities in a family or a civic club or in a city hall, it takes understanding and compromise to be able to create workable relationships when basic conditionings are different. Washington has been notoriously disinterested in understanding these differences and attempting to meet Russia halfway. In addition to my personal experience with Putin, I’ve had discussions with numerous American officials and U.S. businessmen who have had years of experience working with him –– I believe it is safe to say that none would describe him as “brutal” or “thuggish,” or the other slanderous adjectives and nouns that are repeatedly used in western media. I met Putin years before he ever dreamed of being president of Russia, as did many of us working in St.Petersburg during the 1990s. I’ve been trying to ascertain whether he has changed for the worse since being elevated to the presidency, or whether he is a straight character cast into a role he never anticipated –– and is using sheer wits to try to do the best he can to deal with Washington under extremely difficult circumstances. If the latter is the case, and I think it is, he should get high marks for his performance over the past 14 years. It’s not by accident that Forbes declared him the most Powerful Leader of 2013, replacing Obama who was given the title for 2012. The following is my one personal experience with Putin. Welcome to “Other Points of View” on Russia. We believe there is need in the public forum for a venue which offers opinions and facts that at times may differ from the prevailing view in western media. Our point of view is not political, is not theoretical, and is not academic. It comes from decades of working at the grassroots of Soviet and post-Soviet society and being avid watchers of Russian politics, economics, history, societal conditioning and current mindsets. Please review our history in order to better understand our perspective on Russia today. Truthfully many in America respect Putin much more than their own government, I live here I know. The US government is more like a foreign entity that has taken over the country and many do not trust it. Many people fear in the back of their mind when this entity will turn on them, in many ways it already is. The thing people admire about Putin (and yes they do admire his leadership) is that he addresses issues directly and addresses issues in a sensible realistic manner, unlike the Orwellian psyops double speak we get from our own government. He seems to be somebody who is being pushed into a fight by the hallway bully. He seems to be trying to find dialog to the problems instead of jumping into the trap set by Washington, unfortunately they are leaving him little choice. Everybody knows if Washington can forced Russia to respond militarily the western media will go into overdrive painting the story of an aggressive attacking Russia that must be stopped. Looking back on the psychology of the ruling elite in the West, this is a common practice, create a problem then blame the victim for the problem they created. You saw this in the housing bubble created by the banks then blamed on the people taking out the loans and in many other issues. We see this same form of insane reasoning being used in international politics. Create the problem then say, Why did YOU do this, Look what YOU have done, YOU have created a problem here…..Insanity at the very least. As a disappointed citizen of JewSA, America did have to witness not only 8 years of Bush Jr and the lies about mass weapons of destruction because people aren’t that stupid, so then the masses of people turned to a man (Obama) that the majority of people simply can’t relate to. As far as Obama dismissing Rahm Emmanuel in 2012, which the Jews claim that Emmanuel quit and is now Mayor of Chicago … that does not matter. 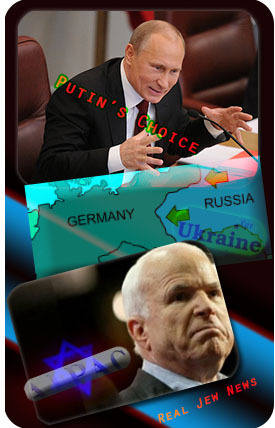 With war monger John McCain in Kiev promoting masses in uprising, Jew Nuland pulling all of that with the neo-Nazi clan that is ignored and attention is diverted from Nuland, and along with many other issues, it appears that the US is a very corrupt government served on conquest, political gains, self-indulgences, and war. It appears that even though Obama buckles as he is weak, he appears to be the only guy in there other than General Dempsey of the Pentagon that really wants peace. In light of this, Obama is not an ordinary American. His radical ideals are different than many Americans and he doesn’t look like us either. For the fact that Obama does appear to be very much a socialist with his Obamacare of course, as well as some of his radical views, I cannot discourage a president that does want to go down in peace. Obama has worked in collaboration with President Putin of Russia, which even Putin had an article that he wrote himself to be published in the Jew York Times, telling Americans that Obama is seriously trying to work for peace. If this was not the case, the US would already be in World War III after a strike in either Syria or Iran. The concept that I gained was Putin telling Americans to stop always wanting to go to war, as the US and Russia are the two countries that they are going after to destroy. I feel that many Americans need to repent and find God. I am not an Obama fan, but I feel Americans all need to gather in unity to preserve this nation that was once the most loved nation in the world and is now the most hated nation in the world. I will say that my viewpoint slightly changed after reading several articles on the dismissal of Rahm Emmanuel (Israel Spy in the White House) in 2010. I also slightly changed my viewpoint when Netanyahu’s friends got together in 2010 and 2011 to throw money at Republicans in hopes for Romney, as Obama and pro-Obama people began to distant themselves from IsraHell. This is evidence in Jew Adelson’s $150 million endorsement for Romney and further evidence for the upcoming 2016 Election. This money is only in the best interests of Israel of course. I think the only reason Obama is standing after 55% Democrats resenting voting for him, neocon Republicans hating him, and many Americans strongly not liking him is because he is a minority. If he was white, he would have already suffered the same fate as JFK. While I believe the socialist ideals of Obama need to be reversed in the future, I cannot go against a man that has been doing everything in his isolated, lonely environment to provide distance from the Zionists, although he has buckled more than once and is surrounded by betrayers, such as Rice, McCain, Hillary Clinton, and more. It is hard for any American to support anything American while the country is going down the tubes. I equally am not as optimistic about Putin as some others are. It is nearly impossible for any American to support Obama’s radical views and no one can serve two masters, as you will love one and hate the other or vice versa. I feel for this reason, they swing the pendulum back and forth because they know this. That’s why I look at what the opposition is and if it is controlled. The Jews in Russia do state that they have been very comfortable in Russia during Putin’s terms, and so many other factors, I can’t bring myself to think of Putin as a possible future equivalent Czar. But the US will get blamed, and rightfully so, for intentionally causing the overthrow of democratically elected Yankovitch under the leadership of Jew Nuland, who brought those neo-Nazis in and have basically seized control of the Ukrainian coup. That is not Russia’s fault. That is the US and EU’s fault, along with the Ukrainian coup. Hopefully this situation will end here. I have provided some positive aspects that there is a small minority of politicians and military officials that are doing their best for what they believe is right, but the bad outweighs the good here in America. I guess we will see what happens. Nathanael appears to be a strong supporter of Putin for the obvious reason that Russia actually didn’t do anything wrong to cause this chaos in Ukraine and it was JewSA’s fault. Brother Nathanael though is entirely correct on the US’ stance. So I am not going against anything he’s stated. Globalised economy and global dependence versus local economies and local independence, what do you think is more stable from an economical and political perspective? Both have advantages and disadvantages, therefore the answer should be as objective and natural as possible. All biological species coexist and interact in a very complex yet stable way. Nature should be THE example for the most natural human coexistence. Nature shows that organisation on just one (global) scale is an unstable organisation (an illusion), which can be proven scientifically. And that is exactly what we experience today: human societies become increasingly unstable BECAUSE of globalisation. Nature also shows large scale coherence, such as the 20% oxygen in the air, which is result of the earth flora, and essential for the earth fauna. Oxygen is a global scale and natural connection. However this global connection is an EXCEPTION: practically all other biological interaction is organised on much smaller scales. The internet, the sharing of human knowledge and consciousness, this is almost like oxygen, all humans need this. But when it comes to all other human needs (such as energy, food, housing), the only stable and sustainable way to provide in these needs is in the form of small scale interaction and organisation (the smaller the better, but there are natural limits to this as well). The trend towards sustainable energy and ’small footprint’ technology, it is essential. Nationalism is only the political (for this reason unscientific) expression of a very healthy and natural form of human cooperation, and on a smaller scale with respect to the Jewish globalists world view. For instance, each country can build solar grade silicon factories and solar cell factories, and purification of silicon can be done with concentrated solar heat (just an example). Independence from the globalized/centralized fossil/uranium fuel cartel, this simply means stability and peace, we can all understand this. Brother Nathanael has always been right about Judaism: it is the religion of death, since the impact of Zion-globalism is simply permanent DEATH on a global scale. Yes, we taste the toxic fruits of the multi cultural and multi racial mixing. But, of course, the modern princes of this world are in their own shelters, far away from the hate-filled cities. It is treason. It is satanic. It is modernity. It is the end times. Great piece Brother Nathanael, you explain the essentials in very simple and stark terms. I hope this article receives the wide circulation it deserves. Some very useful remarks by commentators too. the comments section of a site is often a very good index of quality, and yours goes from strength to strength. Despite the ubiquitous misinformation pumped out by the MSM there is a great and growing hunger for truth in the world. Truth is an essential soul-food, as well as being ‘what will set us free.’ When Jesus enjoined “feed my sheep” (John 21:15+) he was not talking primarily about dietary matters! You act as a real pastor should do in this, helping people to develop their understanding of events. What splendid work! Even though, as we are reminded in Matthew 9:37 “The harvest is plentiful but the labourers are few,” truth will prevail. In order for there to be a continuation of good policies in any nation, politics must change. I think that President Putin must be allowed to choose the next President himself and he must not be forced to resign at the end of a term because that term is ended. President Putin knows what he is doing. I personally believe that he is weeding out the Jewish oligarchs. He has to be careful though. That’s why many are still there. I believe that he should be able to choose ALL members of the government since they all must agree with his program. Think that I am saying that he should be a dictator? Well, imagine the great God of heaven allowing Lucifer and his fellow servants having seats in the government of the universe. Thank you for sharing the Russia Report by Sharon Tennison. I often hesitate to leave my comments, as I’m humbled by such eloquent and concise writers such as yourself and Bro Nate! With that said, I encourage everyone to go to the Russia Report link and read it word for word. It is very illuminating. Ms. Tennison’s 2+ decades long collection of her thoughts, her personal encounters and other’s encounters with Putin truly reveals who he is…AND Putin is who Bro Nate consistently tells us he is! True religious (let alone Christian) devotion is nearly devoid in most of the world’s leaders. As well, noble character is a thing of the past, but not for Putin. Putin is one of the rarities. Observance of and holding fast to law, both nationally and internationally nearly ceases to exist. Putin continues to abide by the laws and conventions. To date, we don’t have any significant ideological differences. But we do have fundamental cultural differences. Individualism lies at the core of the American identity while Russia has been a country of collectivism. One student of Pushkin legacy has formulated this difference very aptly. Take Scarlett O’Hara from ‘Gone with the Wind’ for instance. She says ‘I’ll never be hungry again’. This is the most important thing for her. Russians have different, far loftier ambitions, more of a spiritual kind, it’s more about your relationship with God. I think Putin has done a marvelous balancing act to date. You can only go as far as the wings under you. As others have noted correctly, he is one man - to go any further he needs more support from the populace to do so. It is extremely important that Putin for the Holy Russia legacy and the Christian Faith are educating, preparing, and training young and strong successors that can face the eternal Jewish Tribe’s battles there in Eurasia and around the world. Seldom will the “Western media” give a single word of truth about Russia and Putin, because the West is at war with Russia. Morris 108, a Jew himself, said that Jews have been at war with the Slavics for at least 100 years and pitting one Slavic nation against another is a joy for them. But not for Morris who is a good man. Others say that the Jews have been at war with the Slavics for at least 500 years. Of course, as everyone knows by now, America is run by Jews, therefore America is at war with the Slavics. This piece suggests the number 6,000,000 for the Jews death in WWII was chosen for its Kabalistic significance, not because it has anything to do with reality. GUESS who wants to go into Ukraine and do Oilfield technology? Schlumberger based in Houston USA and Paris. Halliburton based in Houston USA. Halliburton is the very same scumbags who built all the FEMA CAMPS in USA and stole all the Re-Build, Clean up Money $ Billions in IRAQ. Now they want to go into Ukraine. Just look at what the JEW World Order has done to UKRAINE. The Goal= Get White people killing White people. Russia against Europe, then nuke one side to start an all out exchange. Weaken Europe through war with Russia, then remove Western Europe from history. Set up new world order, dissolve all national sovereignty and enslave humanity under perhaps a Jewish system. Sorry no human is uncorrectable. Putin is likely in on it, he’s just playing the Christian card because it’s useful. His interests are in Russia not in anything else. Like saving the world, why should they be? White people, if your dumb enough to fight each other AGAIN (WW1 & WW2) in 40 years you wont exist. End of Story. Beginning at about 1:45 in the video below, this Jewish Rabbi explains what Israel means to him: a place that he calls home, and that no sacrifice is too great for his having this Israel that he calls home. Also God does not seem to be mentioned too much in this video. It’s all about oil and natural gas. 80 years ago Hitler bragged that he was going to establish a third reich using Russia and its resources. Then Russia had a population of 170m and the number of people was about 1 to 4.5 kms,.. Now Russia has only 150m, which just means the temptation to smash and break up Russia is all the more lucrative and likely. So it’s about resources, and religion is just a game card for some. The danger is the White race will be reduced and weakened from it’s current 11% of total world population to something far less, which represents a disaster, the demise of Christianity and Western civilisation. Look what happened to the elite ethnic group that established ancient pre-Rome — they got wiped off the map by the Romans! Why, they became a minority. Also the missing Malaysian airliner is being used as an excuse to locate Russia Nuclear Subs in the western pacific and Indian ocean, Just some food for thought. Luke makes a lot of sense in his comments and so is Patrick J. Buchanan except the very last part of his article. What/whose terrorism did he have in mind? I also get the feeling that the aim is to weaken Europe through war with Russia and perhaps even exterminate the White population or the best White elite of Europe and suppress any form of nationalistic revivals. Amazing that even the UN Security Council seems confused by the very definition of the term ‘legitimate’ whereas of all the parties concerned they ought to have better legal dictionaries. But this shows that the UN is siding with the West, however brazen and illegitimate being the West’s stand, a stand that even a child can see thru. The (un)UN should bear direct responsibility for the dire consequences of this conflict. The Prague Trials in 1952 presaged Russia’s break with Jewry. This was confirmed in 1957 when the last Jewish member of the Soviet Presidium, Lazar Kaganovich was expelled. Also, while Soviet Russia supported Israel in its 1948 war, this support ended in the 1950’s. I wish to offer an alternative response to your statement. After the fall of Constantinople under the Ottoman Turks, Moscow inherited Byzantine tradition as the “Third Rome”*. So it is incorrect to say Constantinople was the last stronghold of the Byzantine Roman Empire. Constantinople evolved as one of the most dynamic cities under the rule of Ottoman Empire. All churches were not destroyed, but preserved and maintained in a harmonious manner, while converted into a mosque. You can still marvel into the glorious Byzantine art on Hagia Sophia at Sultanahmed and Chora Church in Edinerkapi, Turkey. Kindly take note that an even more barbaric disaster occurred in Constantinople during the Fourth Crusade on 1204. In that year, the city of Constantinople has been sacked, all precious Christian relics (such as St. Andrew, The Crown of Thorn) stolen, the Burial of The Byzantine Roman Emperors at the Church of the Holy Apostles destroyed, and great monuments (Hippodrome, Palace of the Emperor) have been destroyed by the Catholic Latin Frank Armies. Many ancient scholars cited the sacking of Constantinople was the greatest crime against humanity in the history of mankind. Meanwhile, when Constantinople was conquered by Sultan Mehmet II, he preserved the great structure of Hagia Sophia, against his advisors advice who wishes to destroy the structure. Over the course of history, architect Sinan preserved and maintain the condition of Hagia Sophia due to its invaluable cultural heritage and outstanding monument built by the smartest of Byzantium’s minds. I suggest you need to relook the barbaric deeds of the Roman Catholic armies during the Fourth Crusade in 1204, and see how well the Ottoman revive the glory of Constantinople post 1453. Yep Luke, the majority of the Whites will be destroyed. Why - because the majority of them sucker up to the Jews. Even your cousin, dude. I submit to you that the conversion of the Church of the Most Holy Wisdom into a mosque was every bit a desecration as was the so-called Fourth Crusade. While one cannot expect anything civilized to come as result of conquest, we Orthodox view the sacking of Constantinople as unforgivable as if Mecca were to be turned over to Donald Trump for him to build some shopping malls and casinos around and on top of the Kaaba, would be to you ( a presumed Moslem). Consequently, the Church of the Holy Wisdom something which must and will be restored to and re-sanctified by the Orthodox one day! And btw, Raja, the Christian blood that was spilled by the Ottomans back then continued being spilled into the 20th century, with the massacres and forced re-locations of Armenians and Greeks by Kamal Ataturk’s Young Turks. This violence proceeds more or less unabated to this very day with all these proxy wars in Syria and Iraq, sustained and perhaps instigated to some degree by today’s older Turks ( although today at the behest of their current Israeli/Saudi/American/NATO masters — pick any one, they are all the same ). And even more recently there are testimonies of Turkish being spoken, having been heard ( shouted actually ) during the Ukrainian/Halychanian riots and previously during the illegal usurpation of the elected government of Moldova a couple of years ago. 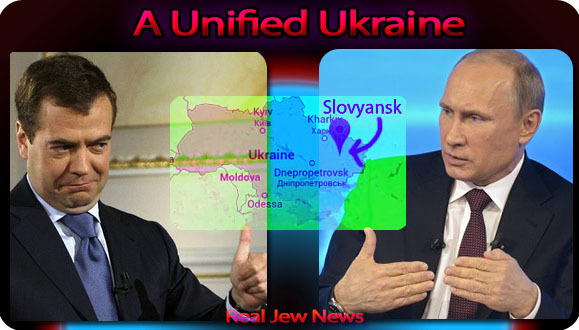 The Jewish Oligarchy of Ukraine. Oligarchical topography of Ukraine. Andrei Fursov. I respect your view and you are entitled to your opinion whatever the circumstances. The Ottoman Turks had flaws. And I’m not a fan of the Ottoman Empire either. But even the Byzantine peoples subscribed to the idea of being conquered by the Ottoman Turks rather than the Latins. Remember, The Latin systematically engineer the destruction and fall of the great Byzantine Roman Empire.